Construction of the new Champlain Bridge represents one of North America’s biggest worksites. Construction of the new Champlain Bridge represents one of North America’s biggest worksites. 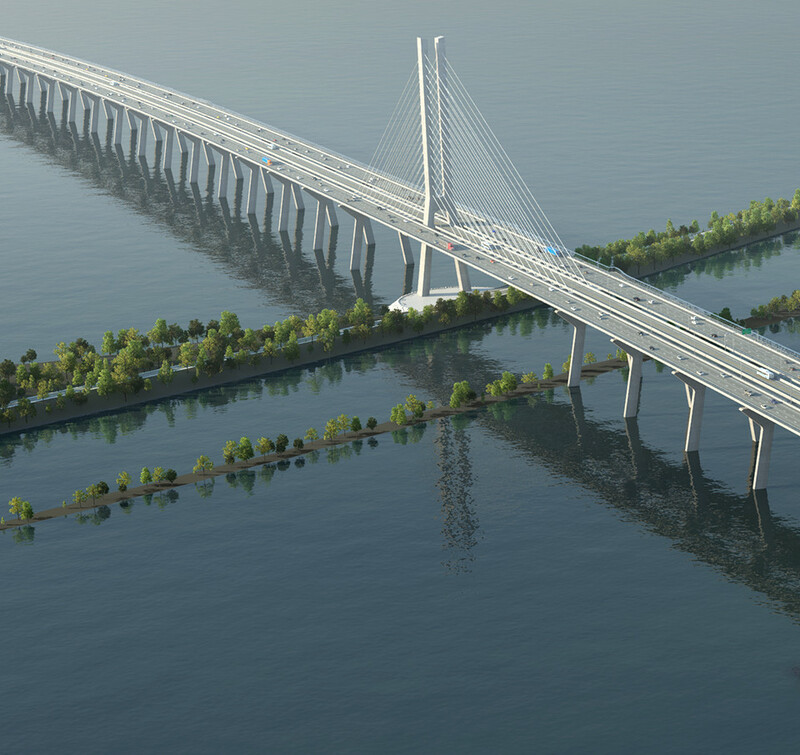 With its impressive scope broadly visible along the Saint Lawrence River, the new Champlain Bridge will change the urban look of Montreal and become a new symbol for the metropolis. Conceived in keeping with sustainable development practices, the project will lead the way in modern engineering and urban integration. The new bridge will have a useful lifespan of 125 years. A challenging 42-month timeline has been established for construction of the new bridge. This presents a great engineering challenge, particularly since it coincides with other major roadwork, including work on the current Champlain Bridge, the Turcot Interchange and the Bonaventure Expressway. Both in terms of the work itself and communication and traffic management, Signature on the Saint Lawrence is relying on substantial coordination and cooperation between the teams handling these major projects to minimize their impact on citizens. Similarly, significant effort is going into planning construction activities to enable and facilitate the work of the hundreds of workers who will maintain the flow day after day over the entire worksite of the new Champlain Bridge corridor. To meet the challenging timeline, the decision was made to maximize the prefabrication of concrete and steel parts and assemble some on site and some off-site. For this purpose, a total of five jetties (three for the new Champlain Bridge and two for the new Île-des-Sœurs bridge) will be created during the preparatory phase of work (June to November 2015). They will also allow for dry construction of various parts of the bridge and serve as docks for mooring the many vessels to be used on the Saint Lawrence River.